I’ve been making a version of this recipe for about 15 years, and my grandmother made something similar which everyone loved. Of course grandmothers never write recipes down because they don’t measure anything (a pinch of this, a sprinkle of that.) Thank goodness for google which helped me come up with a great roadmap for one of my family’s favorites. In fact, my older daughter has requested this dish many times for her birthday in past years! This is different from the brisket I learned how to make for Jewish holidays. 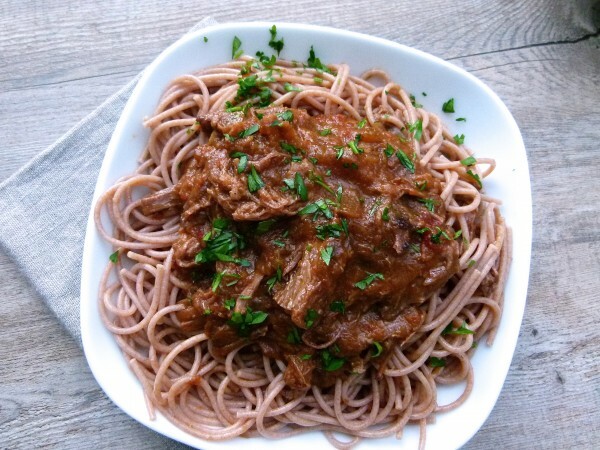 That brisket is braised in an oniony sauce as well, but it’s sliced whereas this one is shredded and the sauce is more tomato-veggie, much more Italian. 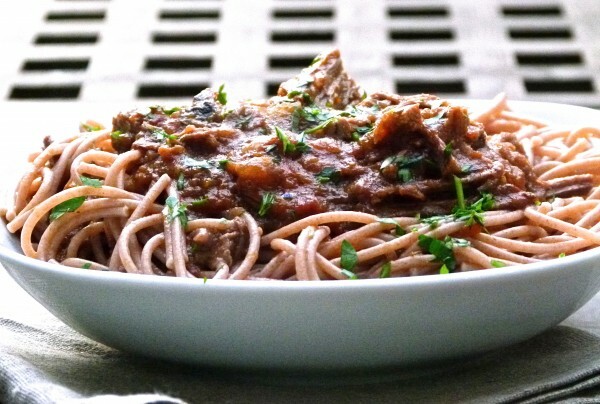 We used to eat this over wide pasta, like pappardelle or fettuccine or egg noodles. But spaghetti and even orecchiette are great. 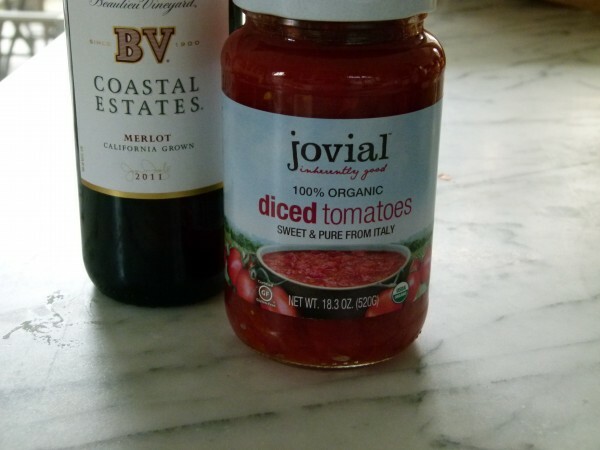 Since I don’t make as much pasta as I used to, we have been enjoying this more over cauliflower mashed potatoes or polenta. For those of you who are hooked on spaghetti squash, I think this would be great on it! Brisket is one of those very tough cuts of meat that can only be made meltingly tender by cooking it low and slow for a long period of time with lots of moisture. Don’t try and grill, sear or stir-fry brisket. You’ll end up with the toughest, chewiest meat ever. Yuck! You can also use chuck roast in this recipe since that cut also needs a long, low and slow preparation. Since it takes three hours minimum to cook, you’ll need to get this going early in the day or do it in a slow cooker, or make it the day before and reheat it. All methods will result in a super soft, very flavorful brisket and sauce. Although I personally think the flavor is a little better the next day. And, this will freeze beautifully! I think this sounds like a good weekend project for those of us who will be stuck inside from monsoon rains (not complaining, just saying) or the bitter cold. Hoping this can help you find a way to stay cozy this weekend! Preheat oven to 325 degrees. Pat brisket dry and sprinkle generously with salt and pepper. Heat 1 Tablespoon of oil in a large oven-proof pot or Dutch oven over medium heat. Sear the meat on both sides until nicely browned, about 12 minutes total. Transfer meat to a platter. 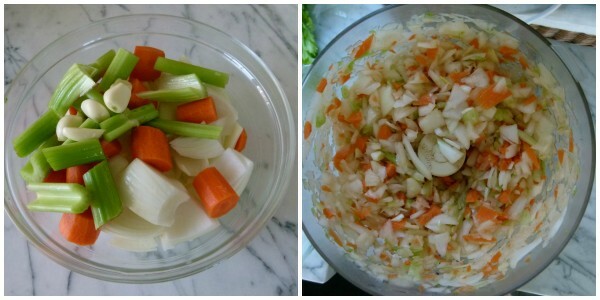 Add 2 Tablespoons oil to the pot and then add the chopped vegetables and garlic. Sprinkle with salt and pepper and sauté over medium heat until tender and golden. Stir in the wine, stock, tomatoes and bay leaves and deglaze the bottom of the pan by scraping the bottom with a wooden spoon. Bring to a boil and place brisket back in the pot. Cover and transfer pot to the oven. 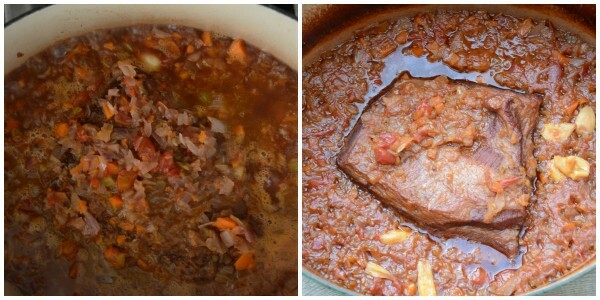 Braise the meat for 3-4 hours or until tender enough to shred with a fork. Remove from the oven and transfer meat to a cutting board. Remove the bay leaves and discard. Remove excess fat from the meat, cut into 2-inch chunks, and shred with two forks. If you would like a smoother sauce, pureé the vegetable mixture either directly in the pot with an immersion blender or in a food processor or blender. Otherwise you can leave it chunky. This can be done a day before and reheated in the same Dutch oven over medium heat on the stove. Add the shredded meat back into the sauce and stir together. Serve over cooked pasta or polenta, millet-cauliflower mash, mashed potatoes or cauliflower-mashed potatoes. Use less liquid if you want less of a sauce. 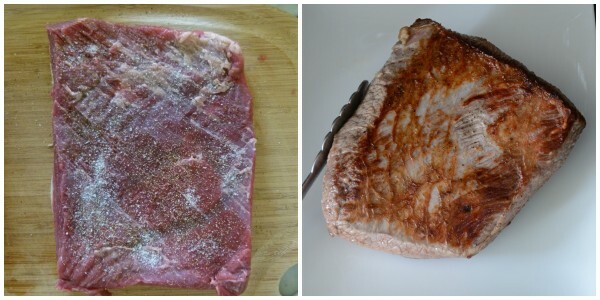 -Sear meat on both sides in a skillet or Dutch oven. Transfer to slow cooker. -Saute vegetables until tender. Season with salt. -Deglaze pan with ⅔ cup wine, 1 ½ cups stock and same amount of tomatoes as stove-top recipe, making sure to scrape all the brown bits from the bottom of the pot. Transfer contents plus bay leaves to slow cooker. -Cover and cook on LOW for 7-9 hours or HIGH 4-5 hours. Proceed with remaining steps 4-6 above. I just wanted you to know that this has become my 1st daughter’s number 1 dish too! (Kind of shocking because she is not the biggest meat eater). I’m making it tonight! I made this because I had leftover cooked pasta that I didn’t want to go to waste. It was amazingly flavorful and not too fatty. Using the immersion blender made the sauce a perfect consistency. Thank you for this recipe that is sure to be a new family favorite for us. This is my older daughter’s #1 favorite dish :). Glad your family enjoyed it! whats your take on a buying a slow cooker? i don’t have one..should i consider it? do you love it?